Bajrangi Bhaijaan And The Ant-Man. It was one of those crazy days! My friend Ramesh and I went to see a Hindi movie and found at the box office that that particular show was cancelled. We found that a totally unheard of 3D English film was however about to start and so we decided to see that just because there was Michael Douglas was in it. Let me review it first. 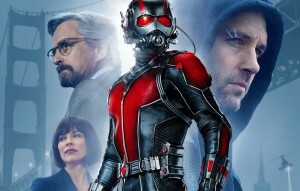 The Ant-Man I learnt subsequently is of a genre called the Superhero films. Apparently these films are based on marvel comics of the same genre. I am not very clued in on either of these and so found the experience totally uninteresting. Even the special effects did not give me any interest to want to see any more movies of this genre. And much to my disappointment, Michael Douglas is more or less a cameo appearance and pathetic in that. I regret that I can at best give it a[rating=3] rating just for the special effects and some humour that at least made me laugh at some points in the otherwise insipid story and delivery. When we came out after watching the movie, we caught up with the Manager of the multiplex who had befriended us for being such regular movie goers. We complained to him about the inconvenience of coming all the way to the theater to be disappointed and he promptly offered to give us a discount on two fresh tickets for the same Hindi film Bajrangee Bhaijaan just about to start in another hall. He even offered to get the tickets inside the hall as the movie was just about to start and thus, we ended up seeing two films back-to-back, just as I had wished I had had in my youth in my earlier post Back To Back. Now this film is another Hindi film that is breaking box office records with the hero in a totally unusual role. Salman Khan is usually an action star whereas in this he is a soft hearted Indian wanting to reach a lost Pakistani girl to her parents in Pakistan. He is unable to get official methods of doing so and so illegally crosses into Pakistan and the story then evolves into one of those wishful thinking human element stories, often leading to tear jerking situations. And typically ends in a fairy tale ending totally unrealistic. 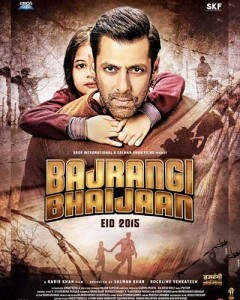 The saving grace in the film is some excellent acting by the child actor Harshaali Malhotra and Nawazuddin Siddiqui which compensated for the hero’s inability to bring some life into his role. The director Kabir Khan deserves credit for trying though full marks to him for the roles of the earlier two mentioned. Kareena Kapoor, I suspect has been added to increase viewer attraction as her role is totally unnecessary to the story which could have perhaps been better off without her. She however does credit to the little that she does. A good cameo performance by the veteran Om Puri rounds off the credits and that is about all. An entertaining and mushy film which will appeal to our softer side. I can not bring myself to give more than a [rating=4] rating though because some one other than Salman could have done a much better job and improved the ratings. And another development which made me call it a crazy day was that both soles of my shoes decided to come off during the intermission of the first film and I could not figure out what had happened till the intermission of the second film. I had to sit down and pull of the partly unstuck soles to walk comfortably. The strips that came off were only thin additional rubber strips to give grip and the main soles remained unaffected. Now a new pair to replace them will be the next project! This entry was posted in Movies and tagged 3D movies, Marvel Comics, Superhero films, Unstuck heels of shoes. Bookmark the permalink. 6 Responses to Bajrangi Bhaijaan And The Ant-Man. Even though you couldn’t see the movie you expected, it sounds like you did all right. Yay, Rummuser! Ganesha usually works overtime for me. I am told that you will be able to see almost all the movies ever made via dish TV or cable there. You might like to explore. first… i love that you go to movies so much! and second… i love people’s different perceptions. neither of those films is one i would choose to see actually. but what is odd is… one of the blogs i follow is a lovely lady close to our age who lives in southern california. she did a review of the ant man and absolutely loved it! LOLOL! thus… my quandary! i too like michael douglas. and i said i’d contemplated seeing it just because he had a cameo role in it. she said “oh no. it was not cameo at all… it was a major role in the film!” she also said it was very funny. i like her very much. and told her i’d see it just because of her review! now i like you too very much! and your review is totally different. i’m thinking i might wait til it’s out on dvd. and see it myself then! I will certainly see Mr. Holmes when it comes around here.